Rockport`s beautiful Blue Wave Beach has covered picnic tables, playgrounds, 2 sand volley ball courts, salt water swimming hole, pavillion rentals, bathrooms, showers, boat ramps, fish cleaning stands, fishing piers, and lots of fun! Enjoy 18 miles of uncrowded, unspoiled beach on this part of the world`s longest barrier island, and one of only three in the United States you can still drive on with street legal vehicles and all things beachy. Our beaches are great for shelling, strolling, sunning, playing and family fun! 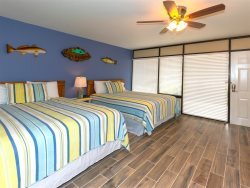 Location: Port Aransas, Texas - just a short drive and ferry ride away from Rockport! The Community Aquatic and Skate Park, nestled within a 12-acre Live Oak Forest, is open year round. The park houses an 8-lane, heated, 25-yard pool and diving area, a whale shaped zero-depth entry children`s pool with slides and sprays, a bathhouse, and a 6,000 square foot modular skate park. Adjacent to the aquatic and skate park is a picnic area and playground, and a 1/4 mile nature trail.